If you belong to a CSA or have a garden, you're probably swimming in summer squash right now. We are. We've grilled it on the BBQ, stuffed it into lasagna, tossed it into tofu scrambles, and made zucchini bread. I must also shamefully admit I threw a few away. See, I don't actually like zucchini. I liked it 3 weeks ago when it was novel and heralded the start of summer. After force-feeding it to myself twice a day, I could barely stand the sight of it. I refuse to be punked by a vegetable. Upon receiving five gigantic zucchinis in my weekly CSA share, I determined to find a new way to enjoy them. Here's how to adapt it exactly as I did. This recipe is vegan (dairy-free, vegetarian) and gluten-free. Use a spoon to remove the guts from the zucchinis. In olive oil, saute scallions, mushrooms, and guts from just one zucchini, everything sliced. Cook until mushrooms are shrunken and tender. You should also have a little brown flavorful goodness on the bottom of your pan. Stir in cooked lentils and seasonings. 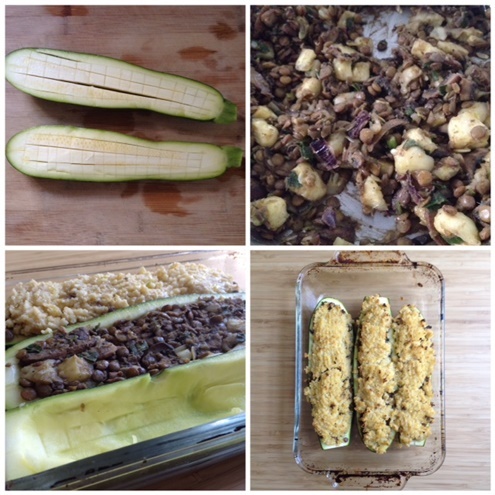 Stuff mixture into zucchini boats. Spoon and press millet onto zucchini boats to make a crust. Drizzle with olive oil. Bake until hot and zuke boats are tender. Broil for a few minutes until tops brown. Put onto a plate and rekindle your love for zucchini. Get the How It All Vegan cookbook to see the original recipe and hundreds of other awesome ones, like the blueberry zucchini muffins and a cheesy zucchini casserole I baked today too. Both recipes are a great way to use up the extra zuke guts.